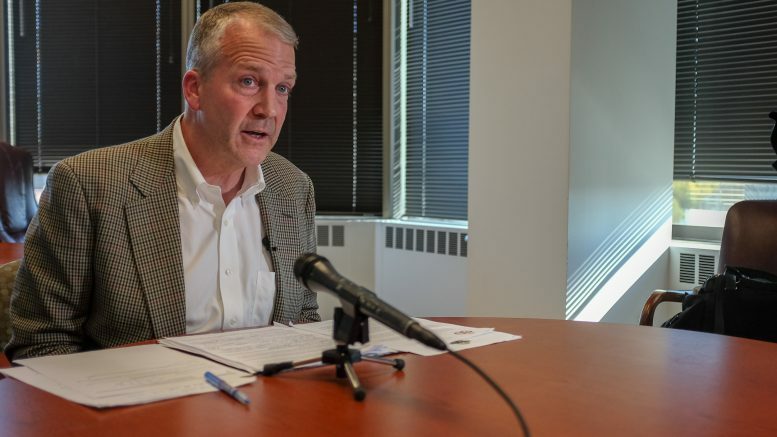 U.S. Sen. Dan Sullivan speaks with reporters at his Anchorage office on Sept. 14, 2018. ANCHORAGE—Alaska U.S. Sen. Dan Sullivan said on Friday that he still supports the confirmation of U.S. Supreme Court nominee Brett Kavanaugh after asking him about concerns raised by Alaska’s largest organization of Alaska Natives. The Alaska Federation of Natives announced its opposition to Kavanaugh earlier in the week, arguing his confirmation would pose a threat to existing laws and protections for Alaska Natives. The concerns largely stem from Kavanaugh’s stated opposition to treating Native Hawaiians the same as American Indians, arguing they have faced different historic treatment by the federal government. AFN fears that similar line of reasoning would be applied to Alaska Natives, which is particularly concerning when Sturgeon vs. Frost will be back in front of the court. Sullivan said he took the concerns raised by the AFN memo directly to Kavanaugh, with whom Sullivan says he has a good relationship from their time working in the Bush White House. The Republican senator said after the conversation, his concerns were put to rest. Sullivan was an early supporter of Kavanaugh, announcing he would vote in favor of his nomination just days after Trump announced it. Sullivan made the comment to reporters at his Anchorage office on Friday afternoon, after returning for a weekend visit to the state. His arrival came on the heels of the first stories breaking that Kavanaugh allegedly sexually assaulted a woman while in high school. This was before the woman came forward to be named in a story by the Washington Post, so Sullivan declined to comment specifically on the allegations at the time. When pressed if he would withdraw his support for Kavanaugh’s confirmation if the allegations turned out to be true, Sullivan stopped short. “If we know for sure he sexually assaulted a female, I would have serious concerns,” he said. Sullivan said he gave a read-out of the conversation to U.S. Sen. Lisa Murkowski and called AFN President Julie Kitka. He declined to elaborate about either exchange. Be the first to comment on "Sullivan stands by Kavanaugh on issues raised by AFN, commends delay over sexual assault allegations"